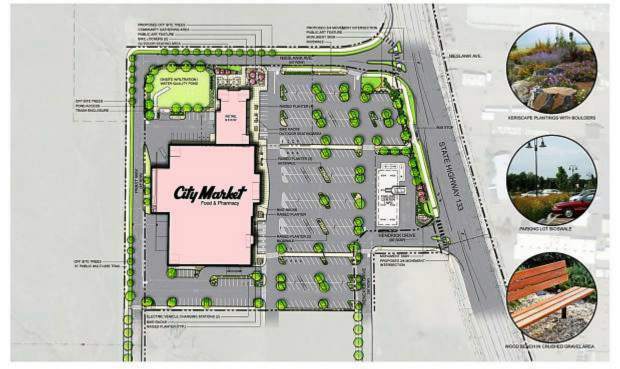 This shows the footprint of the new City Market proposed for Carbondale, but delayed for a sixth time. Uncertainty surrounding the proposed new Carbondale City Market continues, as town trustees granted the project’s sixth extension Tuesday night, this time for 90 days. Given the numerous delays purchasing the property for the new store, at the northwest corner of Main Street and Colorado 133, this time the developer and real estate manager showed up in person to explain the holdup. Joel Starbuck, division real estate manager for King Soopers/City Market, said this project has hit more pitfalls than any other he’s worked on. Starbuck said Kroger’s corporate office has put a hold on capital spending, and he can’t be sure when the word will come whether the Carbondale store will come to fruition. Peterson said they owe it to the community and to themselves to gain some clarity on the deal. The 90-day extension is an arbitrary deadline to allow some more breathing room. “I cannot tell you if 90 days is going to be enough,” Starbuck told the board. It wasn’t just one bid that was out of line, but the whole gamut of bids came in high, he said. So the development team is going to see what can be done to negotiate that difference. Just a couple months ago the store had “its slice of the pie” in Kroger’s budget, said Starbuck. Then corporate called, saying to hold the project as they were rebudgeting. More recently, however, the announcement that Amazon is buying Whole Foods for more than $13 billion is throwing another wrench into the works and affecting markets, said Starbuck. After that announcement, Kroger’s corporate office again instructed Starbuck to hold off on the purchase of the property where the new City Market is proposed. After some hesitation, Starbuck said that the existing City Market at the southwest corner of Main Street and Colorado 133 would not be threatened if the proposal for the new store doesn’t go through. Carbondale Town Manager Jay Harrington said that, despite the 90-day deadline being an arbitrary mark, it’s necessary to keep pressure on the company and developer because the timeline for other town infrastructure projects is based on the City Market proposal. Likewise, the proposal is based on construction costs projected at the time of the town’s initial approval, and while costs have so far tracked with those estimates, the longer the proposal is delayed, the greater the potential for costs to fluctuate, he said. Trustees are still very supportive of the project. “I want to make sure you recognize that we’re open to helping you figure out how to make this happen,” said Trustee Heather Henry. “We’ve been treading water on this project for close to 12 years,” said Peterson, who added that his partnership team is bearing the cost of these recurring delays. “If you look at the economics of this, we’re subsidizing one of the largest food providers in the United States,” he said.